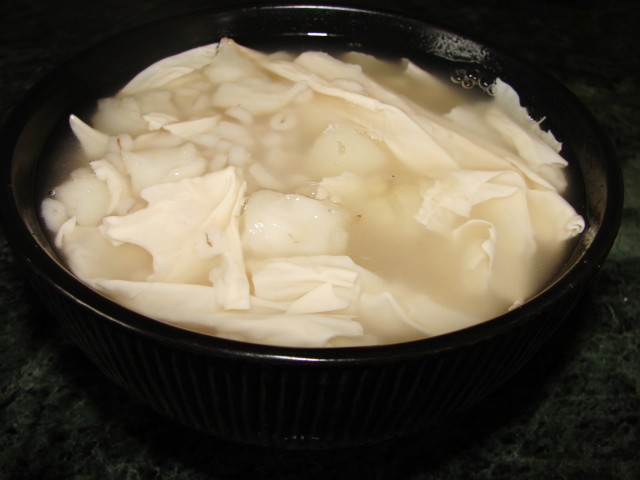 Sweet soup or tong sui is Cantonese speciality eaten as dessert. Tong sui is as common as savoury soup for Cantonese. Soups play a very important part of Cantonese diet. There are hundreds of different tong sui recipes, this featured recipe is one of the very common familiar to most Cantonese and mostly available as home cooking not common in restaurants. Just few ingredients boil with plenty of water and flavoured with sugar. Simple and tasty, warm or cold. Normal ingredients are pearl barley, water chestnut, beancurd stick or sheet, and gingko nuts if available. It's not easy to find gingko nuts over here so I always leave them out. I normally used tiny pearl barley bought from the Chinese supermarket, you can also use English barley available from any supermarkets. Soak pearl barley for 30 minutes or 1 hour till softened. Soaking will shorten cooking time. If not just rinse and boil. water chestnuts, use fresh rather than tinned/canned. Fresh water chestnuts have more flavour. Peel them, rinse and crush with the back of a cleaver to small pieces or cut into slices or small cubes. For the fu chook use normal stick type or flat sheet called 三邊腐竹 san ben fu chook. If using the flat sheet type make sure it is brittle/crunchy when dried, the flexi type is fu pei 腐皮 for wrapping like spring roll sheet not for boiling. Break the fu chook into small pieces. Soak if you preferred I never bothered. If using gingko nuts, remove shell like any nuts, peel off inner skin (browny colour) and remove inner core stem that looks green. This inner core stem is very bitter. You can also buy de-shelled and peeled gingko nuts in vacuum pack, do check the inner stems are removed too. Put all ingredients (except sugar) and cold tap water in a large stock pot or pressure cooker. Boil/simmer till pearl barley and fu chook are soften for about 2 hours on the stove or about 1 hour with pressure cooker. Sweeten with sugar. Serve hot, warm or cold after chilling in fridge. This dessert soup is very soothing, great for anyday. We love it when the weather is warm. The pearl barley and fu chook are very soft, slip down very nicely and the nuggets of water chestnut remain crunchy after boiling. There is also a savoury version of this soup. Add a piece of pork and/or several pieces pork bone to the ingredients. Boil till tender. Remove pork when cooked, sliced and dip with soy sauce or chilli sauce. Season soup with salt instead of sugar.